HYPERMOBILE HIP DYSPLASIA CAM FAIS deformity gives chronic pain in the groin. Keywords; hypermobile hip dysplasia cam fais, short leg. Whew, what a mouthful that is; it's all about chronic buttock, upper thigh and groin pain. It's nasty stuff, starting in the young person. Shall we discover what these terms mean? Understanding this huge, weight bearing joint can make the difference between a complete replacement, or not. Yes, it's worth trying to grasp this material if you are suffering from upper leg and groin pain that won't resolve, or respond to current treatment. And remember too that it's hereditary; catching it early is vital for your children. There are two conditions, one which causes stiffness in the young hip, and the other causing a very hypermobile joint; in other words, exact opposites. In this page we look at how femoro acetabular impingemnt syndrome and hip dysplasia can coexist in the same leg, confusing all and sundry. First let's briefly consider each of these two conditions. DDH and the hypermobile hip. FAIS and the very stiff joint in the young person, who will of course become older, so you find it later in life too. Clinically, there is a greatly increased range of motion of the hip, in both the child and the young adult, with or without pain. Sitting in the lotus position is readily done, and they often make great gymnasts and sportsmen and women. A clicking sound may be heard or felt as the ball subluxates in and out of the socket, depending on the shallowness of the socket, and the slope of the acetabular roof. Beyond the immediate concerns of pain in the upper leg and hip, there is an increased tendency for early hip arthritis due to decreased area of contact between hip and acetabulum. Careful management of hip dysplasia is vital, and it fits well within the chiropractic domain; it often has a knock on affect on the sacro iliac joints. However, the chiropractor must also address the hip joint itself and, in the infant with a clicking hip, in my opinion a paediatrician should also be consulted. Daily exercises are vital to strengthen the buttock and upper leg muscles to reduce the tendency of the hip to subluxate. The Pavlik harness must be worn for about four months to form a deeper socket. Periodically, even in the young child, walking may be painful, either in the groin, or on the side of the hip; an even more serious condition, Perthes disease must be ruled out. The hypermobile hip likewise has an increased range of motion, but without the developmental changes of the socket seen in DDH. Clicking sounds are less likely, but there may still be pain in the hip. The pain may radiate towards the knee and the inner thigh muscles; the adductors are often extremely tender on palpation. This may be generalised hypermobility of all the joints of the body or, if it's limited to one or both hips, then we may think of it as a Grade I Development Hip Dysplasia. A mild case of HDD, but enough to cause pain. Only an Xray can distinguish between hypermobility which is normal and hip dysplasia which certainly is not. ASIDE: There is some debate between chiropractors as to whether hypERmobility (increased movement, highly flexible) or hypOmobility (stiff joints) is more serious . Both are a concern, but in my opinion, it's easier to loosen up stiff joints than to stabilise hypermobile joints. Both, unmanaged, lead to a higher incidence of arthritis. 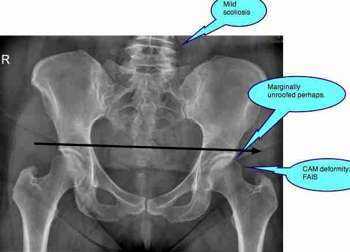 CASEFILE: Hip dysplasia or Hypermobility? A young woman, 16-years old, I couldn't call her a child! recently consulted me with lower back, sacroiliac joint and groin pain particularly on standing and slow walking. She had a long contradictory history of hip pain. Her mother was told by a paediatrician when the lass was only four that she urgently needed an operation on her hip for HDD; but at five a professor of child orthopaedics said that there was no sign of HDD on X-ray, but that she was merely hypermobile. No treatment was needed. 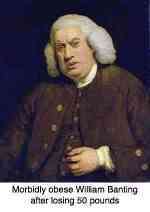 But hip and groin pain began at an earl age. New X-rays confirmed the learned professor's advice: no hip dysplasia. But on examination, indeed a grossly increased hip range of motion and a sacro-iliac joint syndrome. It's going to take careful chiropractic management, and a vigorous exercise programme to keep this young woman from a life-long hip pain and ultimately perhaps hip arthritis. Mixed Pincer / CAM is the most common. Femoro Acetabular Impingement Syndrome, because of the reduced flow of synovial fluid through the joint, also leads to premature hip arthritis and total hip replacement if not carefully managed. Range of motion exercises, done on a daily basis, are vital. Because of a change in gait, FAIS also affects the sacroiliac joint anatomy ... and the buttock and lower back muscles. Both these conditions, FAIS and DDH, are greatly exacerbated if there is a significantly short leg leading to a scoliosis. Leg length inequality needs to be carefully evaluated in every young person suffering from lower back and hip pain. Sometimes an inexpensive insert in the shoe could save them a life time of pain. A short leg also occurs after Perthes disease. There are concerns that once you start with chiropractic, you become a lifelong captive. It is a legitimate concern, and the truth is there is nothing more that some chiropractors would like than to make you into a life long patient. Same as the pharmaceutical companies want you to take their medications, like Statins for example, for life to lower your cholesterol instead of making the simple dietary changes necessary. I say simple; actually new research suggesting it is high glycemic carbohydrate, and not animal fat that causes high cholesterol, has thrown dieticians into a quandry. What's more it's now be proved that there is no solid evidence that a change from butter to margarine has an iota of benefit; butter is back. Both are completely unethical. Good doctors try to get you to make lifestyle changes, not take medicines for life, and good chiropractors try to persuade you to start exercising regularly, losing weight if necessary and perhaps going for a massage occasionally... instead of manipulation every few weeks. Nevertheless, the truth is some conditions are serious and incurable and there is no alternative to becoming a lifelong patient. Hypermobile hip dysplasia CAM FAIS is one of them. It's as true of diabetes in the medical realm as these hip impingement and hypermobile hip deformities in the chiropractic realm. You will be a patient for life. Concerns of once you start... are no more valid that your dentist asking you to brush your teeth and come for a six month check up or your doctor sternly telling you that you must have your hypertension tested twice a year. For the ethical doctor, dentist, chiropractor it's not about money. We earn quite enough. It's about an ounce of prevention, always better than a pound of cure. But, it's true, there are rotten apples in every barrel. Greed prevails in every aspect of health care... carefully assess your doctor - is s/he interested in you, or your money? A hard question. Occasionally at the Chiropractic Coalface one comes up with bizarre cases of INCREASED range of motion but a FAIS deformity (expecting decreased ROM) is found on X-ray. The long and the short of it is that hip and groin pain come in any number of shapes and sizes. All of these conditions, poorly managed, are far more likely to progress to premature hip arthritis and total hip replacement. Mrs B, 50 years old, has had bilateral knee pain since she was 16 years old; and lower back, midback and neck pain since she was 30 years old; and now left hip and groin pain for some five years. She was diagnosed with "hypermobility" as a teen, and responded reasonably well to chiropractic treatment of her neck and back by another chiropractor, who did however not address her hip and knee problems. X-ray of her knees revealed a condition called Chondrocalcinosis which causes Patello Femoral Pain Syndrome - kneecap pain. Her knee responded well to a regimen of patella mobilisation to to gently grind down the fine calcium crystals forming in the HYALINE CARTILAGE ..., knee exercises and a diet rich in magnesium. However, her hip shows no signs of chondrocalcinosis or chronic arthritis. 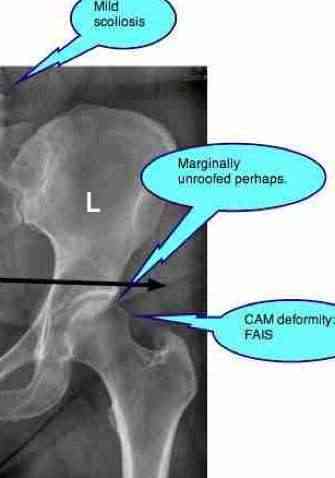 What it does show is HYPERMOBILE HIP DYSPLASIA CAM FAIS - a mixture of hypermobility and a CAM deformity. Ranges of motion of the hip were grossly increased and she had marked pain in the groin (capsule) as the CAM deformity came into contact with the labrum of the acetabulum; the lateral hip and the adductor muscles in the groin were very tender. 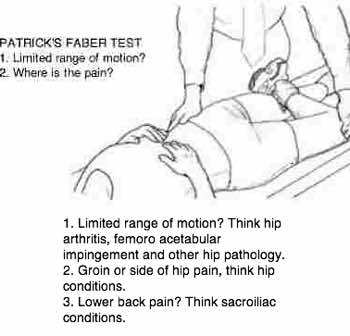 The Faber test was not limited, but painful in the groin. X-rays of her pelvis revealed no true hip dysplasia, perhaps a slight unroofing of the ball, but a CAM deformity, all aggravated by a short leg causing a lumbar scoliosis. She responded well to sacroiliac joint adjustments, mobilisation of the hips, soft tissue therapy applied to the capsule and adductor muscles and a vigorous rehab program. It remains to be seen what the long term prognosis is. 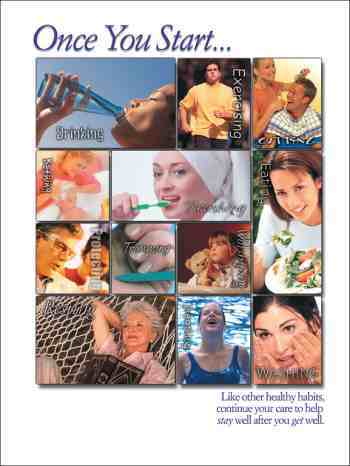 What is uncertain is what effect increasing the magnesium in her diet will have on all her joints. Only research in which patients with chondrocalcinosis are treated in different ways, one of which is an increase in mangnesium will reveal the overall effect of the mineral supplementation. Orthotics to address the leg length discrepancy in the future is likely. The specialised hip exercises at developmental hip dysplasia page are vital; like brushing teeth, they must be done life long. Upper leg pain, Inner thigh and groin pain. In short Hypermobile hip dysplasia CAM FAIS is a confusing condition, with mixed signs, but once recognised it too responds well to Chiropractic. Alas, you will be a life long patient. Accept it.